As a citizen of Michigan, I greatly appreciate our five Great Lakes, the largest group of freshwater lakes in the world. The lakes have been traversed by native people since the dawn of time, and by western man since the 17th century. Thousands of ships have sunk in these waters, and an estimated 30,000 people have lost their lives as a result. 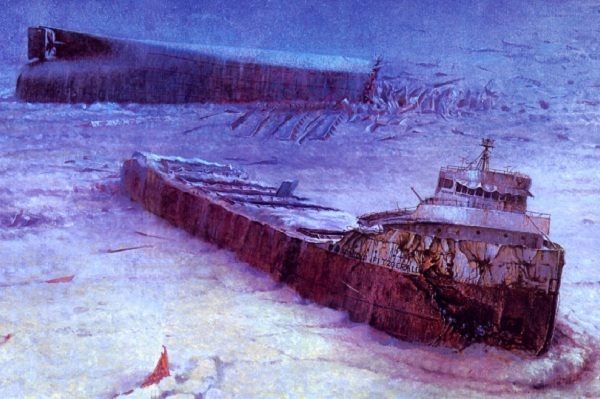 The most famous was the wreck of the SS Edmund Fitzgerald, which sank in a Lake Superior storm in November, 1975, with the loss of the entire 29-member crew. What personal and professional waters are you navigating these days? What stormy or rocky events are causing you to take on water and giving you that sinking feeling? How and in what ways can you bail any water that has entered your worlds, and begin sailing toward calmer, more prosperous seas? This entry was posted in Adaptation, Behavior, Choices and tagged adaptation, Barry Demp, behavior, choices, Demp Coaching, The Quotable Coach by Barry. Bookmark the permalink.